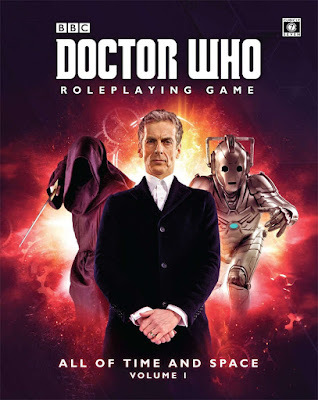 There can be no denying that Cubicle Seven Entertainment has released plenty of adventures for Doctor Who: Adventures in Time and Space – The Roleplaying Game. After all, there is a sourcebook for every single incarnation of the Doctor, from the First Doctor to the Ninth Doctor and beyond, as well as U.N.I.T. and time travel. 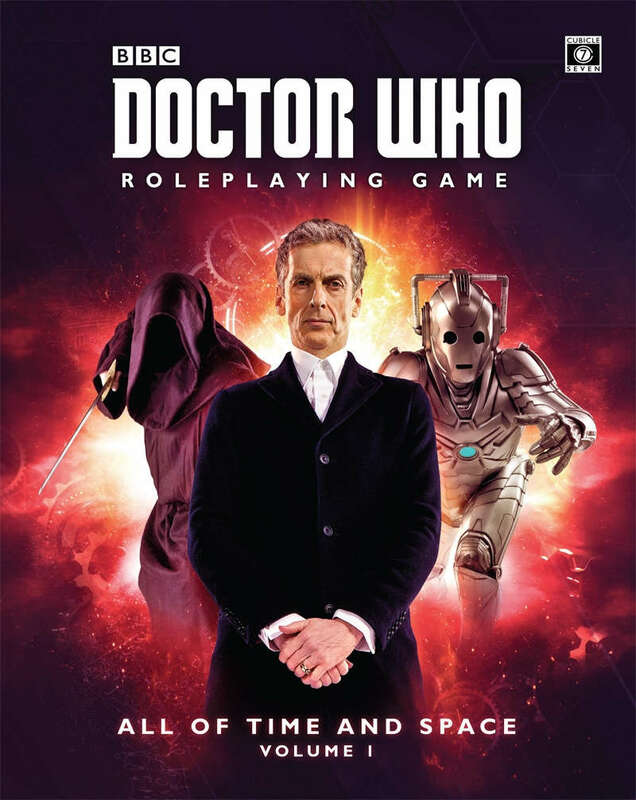 Yet even taking into account the twelve-part campaign in The Eighth Doctor Sourcebook, the roleplaying game is rather short of scenarios that the Game Master can simply add to his campaign. One solution is All of Time and Space Volume 1, a quartet of adventures set firmly during the tenure of the Twelfth Doctor—or at least after the events on Trenzalore. All of Time and Space Volume 1 opens with ‘Ghost Engines’ by Gareth Ryder Hanrahan. The hunt for a missing boy in the present finds the time travellers shunted back into Victorian England where the railway industry is undergoing some form of rapid advancement and conglomeration as a railway engineer appears to bringing the country within the reach of his company, ‘The Great Compass’. Yet this railway engineer might not be as clever or as charitable as everyone says he is, so where exactly are his advances in railway technology coming from? There is a lovely mix of elements here, from Bertie Wooster types and suspicious policemen to ghost trains and steamborgs, with a healthy dash of The Paternoster Gang thrown in, allowing the Game Master to crack open the Paternoster Investigations sourcebook. (Although they are referred to, neither Professor George Litefoot nor Henry Gordon Jago make an appearance, but there is no reason why they should not!) ‘Ghost Engines’ gets the anthology off to a very good start with delightful and well done mystery with lots of opportunity for roleplaying and adventure. The opportunities for roleplaying and adventure continue in ‘The Northern Knights’, but adds intrigue into the mix. Written by Walt Ciechanowski, it sends the time travellers into the religious schism between Catholicism and Protestantism in Elizabethan England. A strange plague has befallen a Shropshire village and the nearby castle, one beyond the capacity of a visiting physician to cure—perhaps the time travellers can help? The task is made the difficult by the presence of a very special guest at the castle—Mary, Queen of Scots! It gets a whole lot more complex when the castle is besieged by Catholic knights who would overthrow Queen Elizabeth and raise Mary in her stead, knights who not only northern, but silver! Which means of course, the Cybermen are involved in what is essentially ‘The Time Warrior’ meets ‘Silver Nemesis’. This is another rich adventure with lots of detail, even one which looks to be an anachronism, but actually not. The third scenario, by Nick Huggins, is perhaps the cleverest one in the quartet, combining elements of ‘Silence in the Library’ and ‘The Time of Angels’ with ‘The Doctor’s Wife’. In ‘Schrödinger’s Expedition’, the time travellers find themselves aboard a space station, but a strange one, given the strange arrangement of rooms, warehouses, libraries, swimming rooms, corridors, and more. Add to this two parallel expeditions to the station—one military, one scientific—and odd flora and fauna, and what you have is an intriguing little puzzle. A puzzle which is made all the more difficult by the fact that neither expedition can meet, but getting them to work together is the key to solving ‘Schrödinger’s Expedition’. Now there is the danger with this kind of adventure that it is too clever for its own good and that makes it all the more difficult to run, but the advice which accompanies this adventure on how to run it is pleasingly helpful. The last adventure is Timothy Ferguson’s ‘The Tomb of Cleopatra’. Another anachronism—an artefact which looks like a Cyberman’s head—has turned up in an archaeological exhibition in Egypt, so of course, the question, where has it been? To find out how, the time travellers have to go back to Roman Egypt not long after the death of Cleopatra and get involved in the opposition to the recently imposed Roman occupation. There is a nice bit of bait and switch involving a threat integral to the era of the Eleventh Doctor, but in some ways, the scenario is the most workmanlike of the four. All four scenarios in All of Time and Space Volume 1 are nicely written with plenty of detail and good advice for staging them. There is also good advice for setting up and running each adventure, not just with time travellers equipped with a TARDIS, but other means, so that members of U.N.I.T. or Torchwood might go back in time and solve these instead of the Doctor and his Companions (or player character equivalents). Each is also rounded out with further hooks and ideas for sequels and more. Physically, All of Time and Space Volume 1 is very well presented and organised, and is liberally illustrated with lots of photographs taken from episodes of the Tenth Doctor, Eleventh Doctor, and Twelfth Doctor. Where the book is disappointing, is in the editing as there are some ugly turns of phrase. Now there is not a bad adventure to be had in All of Time and Space Volume 1. Yet more care could have been taken with the choice of scenarios to be included in this first volume—two of the scenarios involve the Cybermen and three involve both technological anachronisms in Earth’s past and manipulation of events in Earth’s past. Of course these are standard tropes to be found in Doctor Who, but it means that there is a fundamental similarity between too many of these scenarios—a similarity which could have been avoided with better development and editorial guidance and the authors being helped to be a bit more inventive. Again, none of these are bad scenarios, but it would have better to spread them between All of Time and Space Volume I and All of Time and Space Volume II—when the latter appears, rather than containing them all in the one book. The best way to get around the similarities of the adventures in All of Time and Space Volume I would be to run adventures between each, because otherwise, this is an excellent quartet of adventures for use with Doctor Who: Adventures in Time and Space – The Roleplaying Game. The very best thing about these four is that if you thought about it, any one of them works as well on the page and at the table as they might on the television screen. 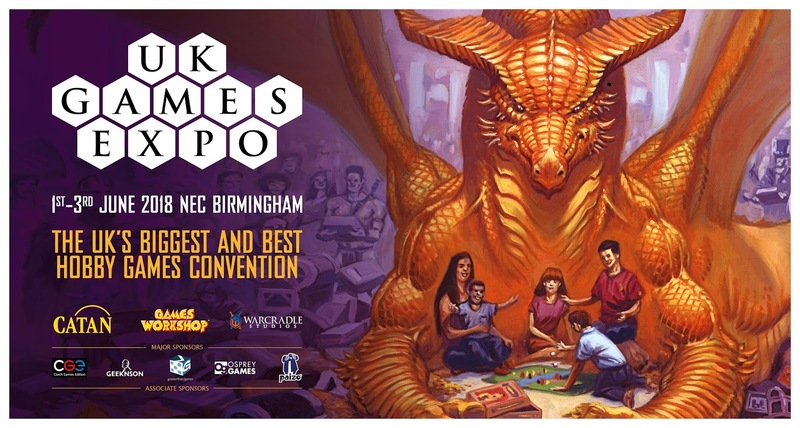 Cubicle Seven Entertainment will be at UK Games Expo which will take place between June 1st and June 3rd, 2018 at Birmingham NEC. This is the world’s fourth largest gaming convention and the biggest in the United Kingdom.